A new Kelowna BC phone book arrived on my doorstep this week. As a Digital Content Marketing and Public Relations Specialist, it bugs me. It has for several years. There was a time when we were all lost without a phone book (White Pages in the front and Yellow Pages in the back). Larger cities had two books, White Pages for regular listings and Yellow Pages for businesses and services. By the end of a year, the books would be all dog eared (with apologies to the dog) and maybe some pages were missing. Doodling with a pen or pencil was more than acceptable. You used the books constantly. Business owners set aside budget to make sure their Yellow Pages ad could be seen. For many it was a critical part of a simple marketing plan - word of mouth and the Yellow Pages, a great combination because it worked. And for some, it obviously still works because the books continue to be printed every year. 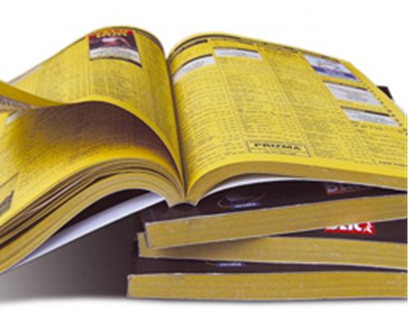 Do you know where your 2015 phone book is right now? Do you even have a phone book in the house or at the office? If you do, what’s it used for? Of the thousands and thousands that were printed, how many got recycled within minutes of delivery (mine was)? And how many more get stuffed into a drawer untouched until next year? A business owner's marketing plan requires focus, strategy and a willingness to discard out of date habits. Most have multiple components or touch points for consistent interaction with both current and potential customers. So what’s your plan? And, do hard copy phone books even matter anymore? According to Stats Canada, more than 90% of Canadians use the internet for email. What does that tell you about ownership of computers, tablets and smart phones? It takes but seconds to look up a business and its Google Map. It takes seconds to find a phone number as long as you have cell service or wifi. So the real question for your business is this. Can you be easily found on line? Whether you are in the phone book is no longer relevant. It may be the world’s biggest excuse for having a lousy website or no website at all. It's also the biggest excuse for not being engaged in Social Media (Facebook, Instagram, Twitter, YouTube and other communication tools). Yet many of these same businesses spend hundreds or even thousands of dollars per month advertising in the traditional Yellow Pages. For many businesses the money is available (Your Yellow Pages budget just might be enough). What’s missing is time, the guts and the determination to develop and execute a marketing plan to communicate with today's consumer utilizing today's technology. You must choose to survive in the digital world, commit to a strategy, set aside the budget and join the conversation with your current and potential customers. If you don't have the time to do it yourself, then search your budget for the money to hire a digital media professional. And, you may want to ask your customers what they did with their phone books.